Two good summer soakings have produced the first ever grass on one of Australia's most remote golf courses. 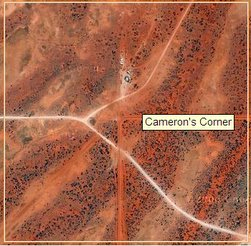 The desert course at Cameron's Corner straddles three states, South Australia, Queensland and New South Wales. Greenkeeper Bill Mitchell says the fairways are looking that good, he might have to get the lawnmower out of the shed. He is also planning to expand the course from three holes to nine. "I've had to clean up one hole, which is hole number one," he said. "I had to clean him up, sweep him, scrape him, because it was actually getting grass on it. "I should've let it go to mow it. "The second hole is on a claypan and hole number three, I will mow him. "I'm thinking about putting another hole in South Australia which will be number four, four in Queensland and I'll have the ninth hole back here at the corner." Common folklore in NSW speaks of an annual pilgrimmage to Cameron's Corner on the 31st of December to celebrate New Years three times over, first in New South Wales (which is on UTC+11.00 when on daylight savings time), then in South Australia (UTC+10.30 DST) and then in Queensland, which is in the same time zone as NSW but does not have DST, and hence is in UTC+10.00. This means that New Years can be celebrated (NSW time) at 12.00, 12.30 and 1.00am.